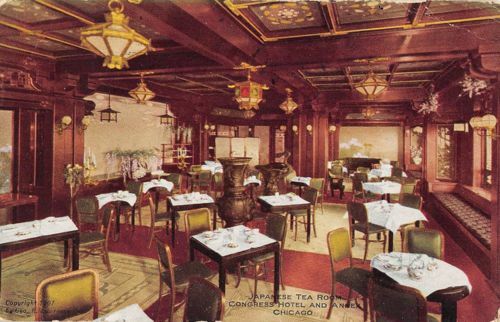 It's not often I come across vintage postcards for old hotel tea rooms, so I was especially pleased to find this week's tea room postcard from the Japanese Tea Room of the Congress Hotel and Annex in Chicago. 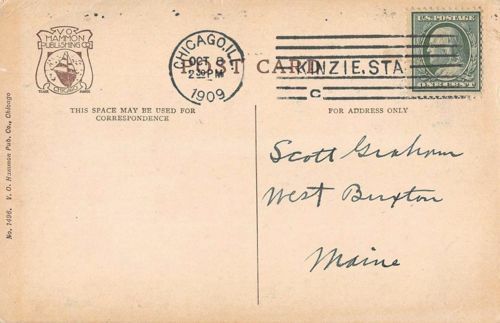 Happily, this hotel is still in business today, long after someone sent this postcard to Scott Graham of West Buxton, Maine in 1909! According to the hotel's website, the Congress Plaza Hotel was originally constructed in 1893 and "featured cobbled streets, gaslights, and horse drawn carriages. The hotel was originally called the Auditorium Annex when it opened to house the throngs of visitors to the World's Columbian Exposition in Chicago. The original conception was an annex with a facade designed to complement Louis Sullivan's Auditorium Building across the street, at the time housing a remarkable hotel, theater and office complex." 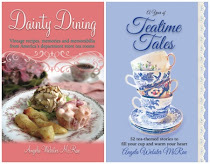 They don't mention serving afternoon tea today, but perhaps the hotel should consider a few special teatimes honoring its tea room of yesteryear! 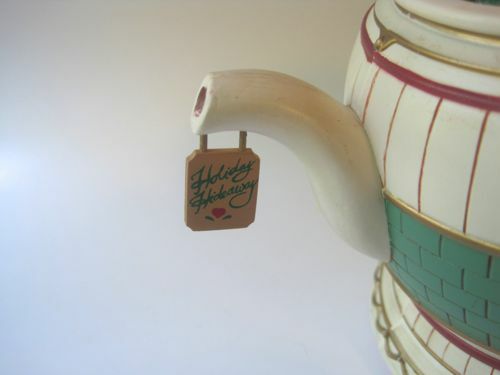 Thanks to my now-regular stalking of the Carrollton Goodwill store, I am one Christmas teapot ahead for the holidays. 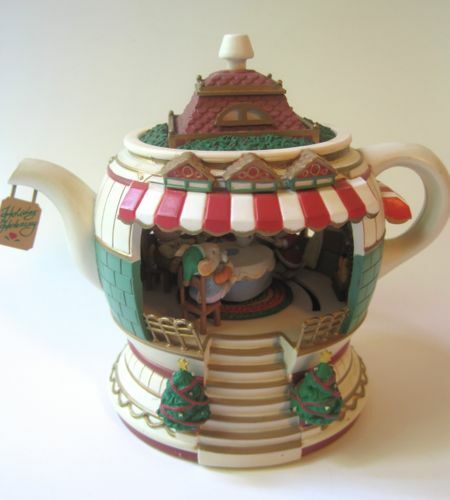 I found this 1992 House of Lloyd musical teapot for $2.52, which I thought was a mighty fine price! 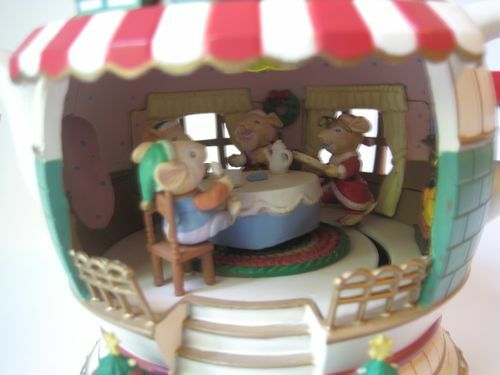 With the turn of a switch on the back of the 6-1/2-inch tall teapot, the little mice start dancing and rocking around the table, all to the tune of "We Wish You a Merry Christmas." The light above the table doesn't work, alas, and the battery compartment appears to be superglued shut, but I am OK with that considering the price I paid! This "Holiday Hideaway" is a fun addition to my Christmas collectibles, and what a bargain. A friend who bought some postage stamps this week was surprised to be handed a sheet of *poinsettia* Christmas stamps, yet another reminder it's never, ever too early to shop for Christmas! 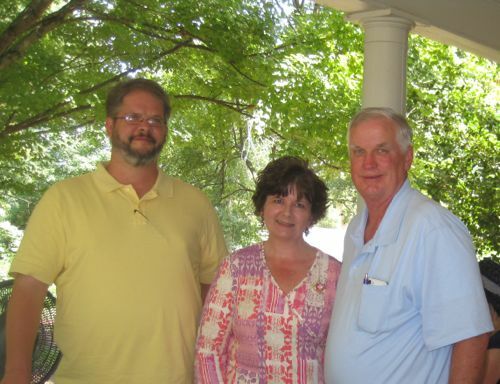 Many of you who've read this blog over the years know that I'm close to my Aunt Jane, who is mildly mentally retarded, and that my sister and I try to spend a lot of time with her, especially now that our mom's passed away. 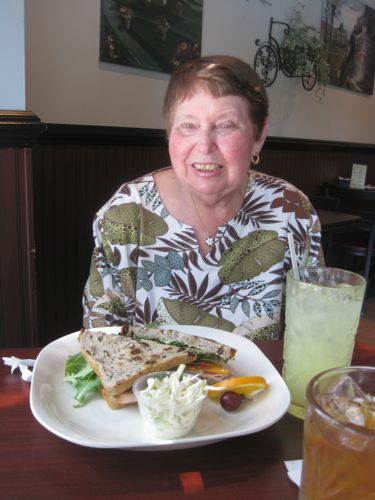 Monday was Aunt Jane's birthday, so we spent the day shopping in her old hometown of Marietta and enjoyed a nice lunch at the Vineyard Cafe on the Marietta Square. 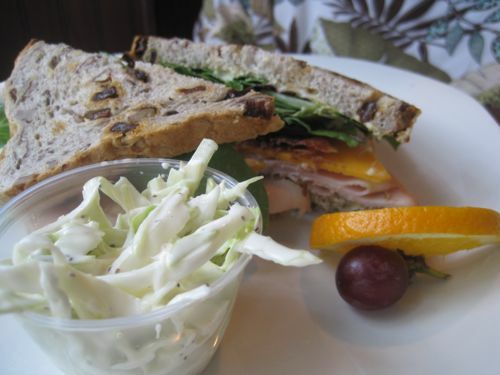 Aunt Jane ordered the Classic Harvest Sandwich of Sliced Turkey Breast, Bacon, Cheddar and Mixed Greens with Vineyard Dijon on toasted Raisin Walnut Bread, and for her side she ordered Cole Slaw. She said it was delicious and ate nearly every bite of it all! 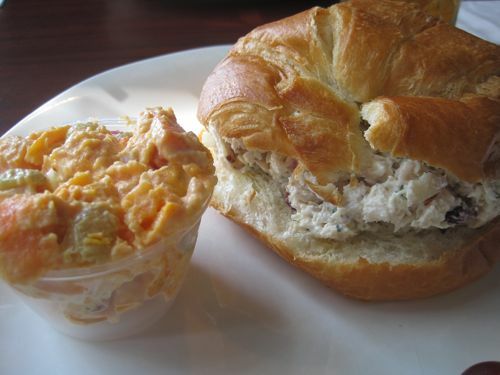 Because I've had tea there several times before, on this day I decided to try their Café Croissant, a Creamy Chicken Salad with Cranberries and Almonds served on a croissant. It was wonderful, and I really loved the flavor of the chicken salad, but I must say I was wild about my side dish, their Sweet Potato Salad! I've never had potato salad made with sweet potatoes before, but I absolutely loved it! Our table was by one of the windows overlooking the Marietta Square, and on such a pretty day it was a lovely place to celebrate my aunt's birthday. We also enjoyed shopping at the gift shop downstairs, and I came home with a couple of new teas I'll be blogging about once I've had a chance to try them. 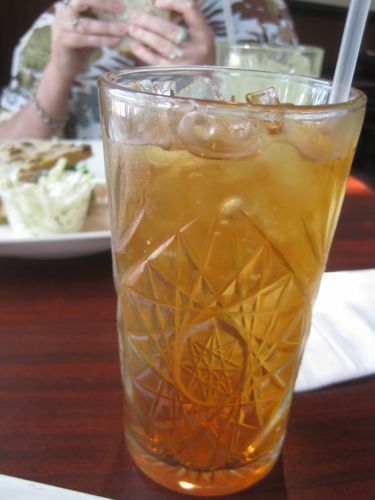 If you're ever near Marietta and want a great place to stop for lunch or tea, I definitely recommend The Vineyard Cafe! Do you like Indian food? 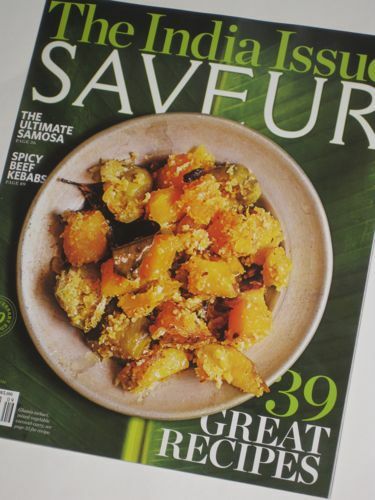 I do, and this August/September 2014 issue of Saveur greatly appeals to me with its Ghanta tarkari, or mixed vegetable coconut curry, on the cover. I guess the last time I had an Indian meal was back in May in England, of all places, and it was wonderful! In fact, I came home and was delighted to find my local grocery store carries naan, a delicious flatbread served with Indian meals. I am trying to refrain from calling it "naan bread," which I understand is just as redundant as going to India and referring to a drink as "chai tea," since "chai" means "tea" in India! 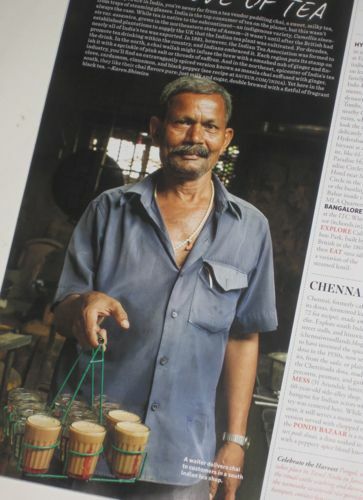 Speaking of chai, here's a photo of a waiter carrying some to patrons of a tea shop in south India. The drinks sure look nice and frothy! 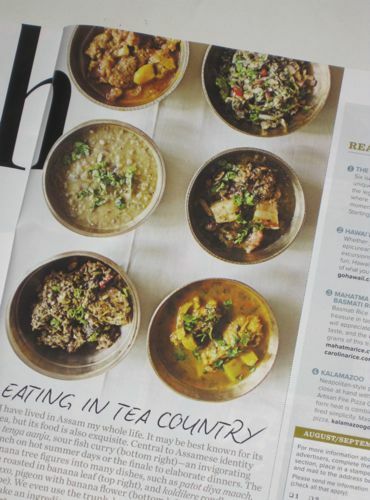 This issue also has a feature on "Eating in Tea Country," in which a cookbook author who has spent her whole life in Assam writes about the food of her region, which prominently features pork and bamboo. I'd love to go visit the tea plantations of India someday, and I'm keeping this issue handy just in case! 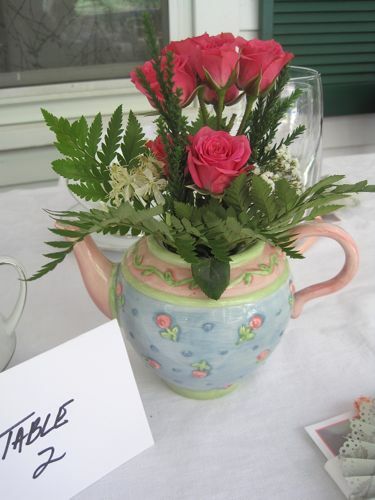 I am still savoring the wonderful time I had at the Senoia Area Historical Society’s “Summer Tea on the Porch” on Saturday. 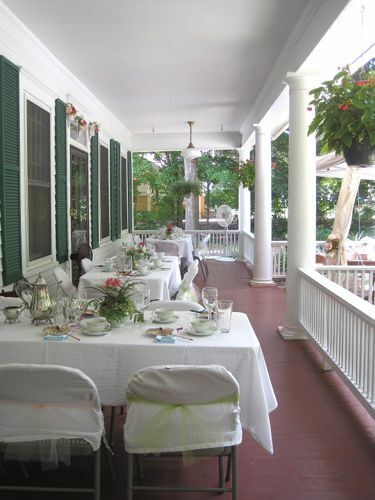 Yes, it turns out, you CAN host 40 ladies for tea on your front porch if your front porch is big enough, and the Pearman porch was indeed. 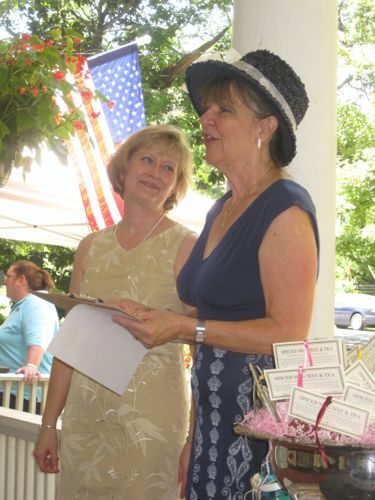 Here, the historical society’s Nancy Roy, at right, thanks the historical society’s president, Dub Pearman, for hosting the tea. And here is Mrs. Dub, Mary Pearman, at left, along with SAHS Museum Director Maureen Schuyler, whose birthday happened to be Saturday. I was so pleased when Maureen won one of the raffle prizes! Whenever someone wasn’t speaking, I was trying to take in all of the pretty decorating the tea's organizers did, and I just know I missed some things. 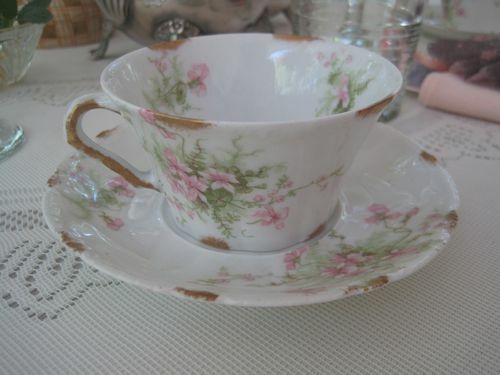 Still, isn’t this a gorgeous teacup? And all the tables had pretty fresh floral arrangements. Charming! 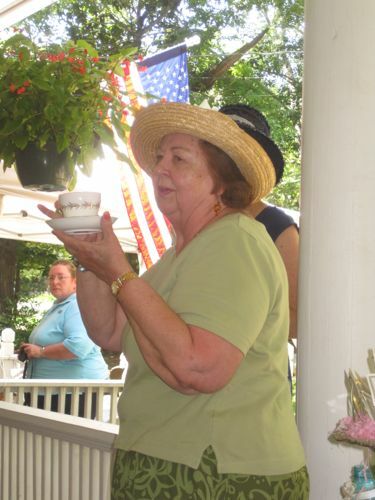 Several of those attending the tea shared teacup stories, including Gloria Downing, who brought a teacup that was a gift to her from her grandfather on her wedding day. Isn’t it wonderful she still has it and brought it to share? Salli Rees shared a sweet story about an aunt and uncle who were like a second set of parents to her, and from them she inherited a Japanese tea set with this teacup. 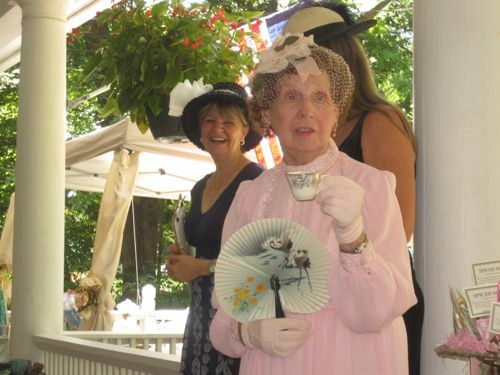 And Martha Gill Clark, who will soon turn 90, shared a small teacup she bought on a trip to New York in 1947. You can just imagine how charming it was to hear all these great stories "live" on the porch. 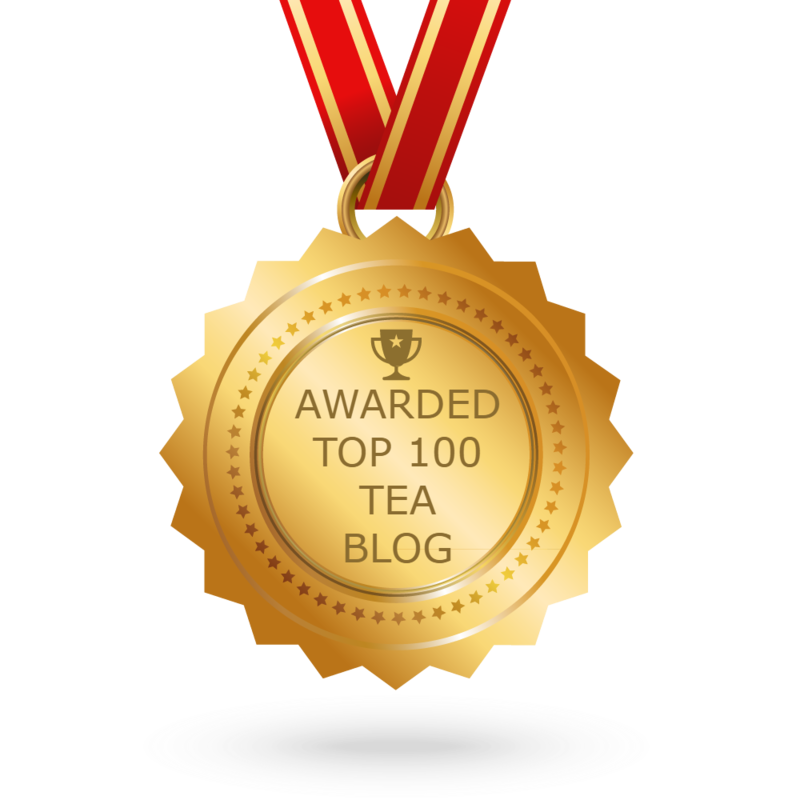 I'm sure I was beaming as I sipped my tea, and I’ll bet some of you are smiling even as you read their stories! Our Hat Contest winner was pretty easy to spot. 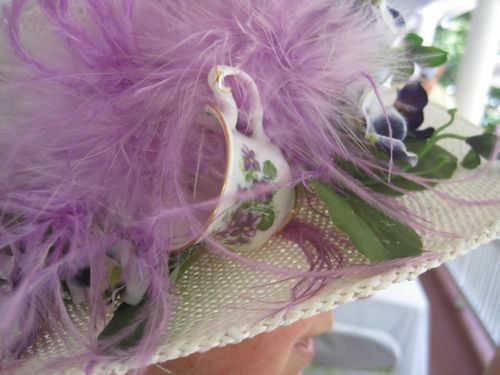 It was Cheryl Bains, whose lavender pansy hat was pretty and looked summertime perfect with her dress, but what sold us all on it was that cute little china teacup she had hot-glued to the side! 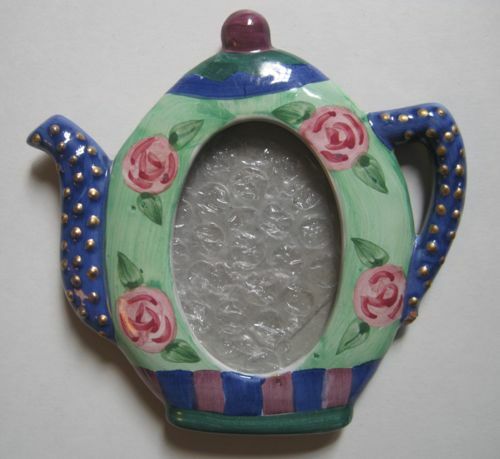 Here’s a close-up of the side with the teacup, which she told me she can pop off and use again if she likes. I thought we should give extra points for her creativity (or creativi-tea), and the other judges agreed! We also agreed we were especially impressed by one of the vintage hats and one of the more modern hats, so we gave honorable mentions to those as well. So here are our winners: Katie Rees, with the modern style hat; overall winner Cheryl Bains; and Martha Gill Clark with her pretty vintage pink hat. 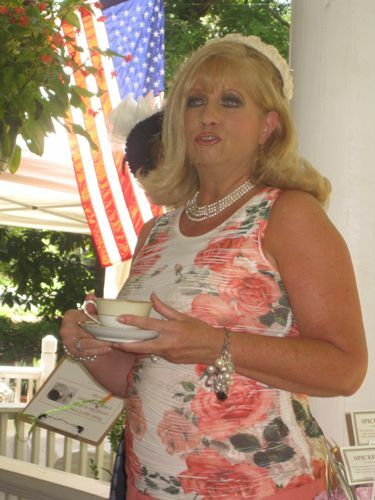 And the generous hostess, Mary Pearman, apparently loves to decorate hats and allowed me to select from a rack on the porch one of her own hats to take home with me, so I chose this gorgeous rose one with peachy pink colors to match my outfit. 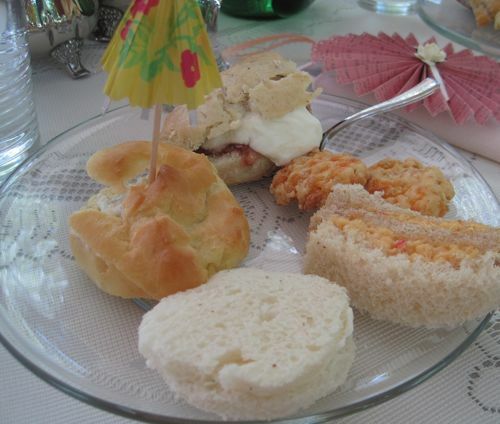 (Maureen Schuyler kindly sent me this photo after the tea!) 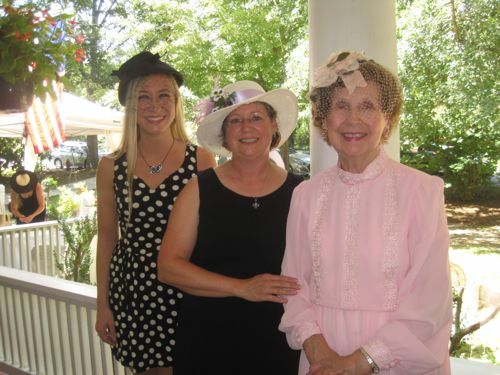 I hope you've enjoyed hearing about “Summer Tea on the Porch” half as much as I enjoyed attending this lovely and most memorable tea! 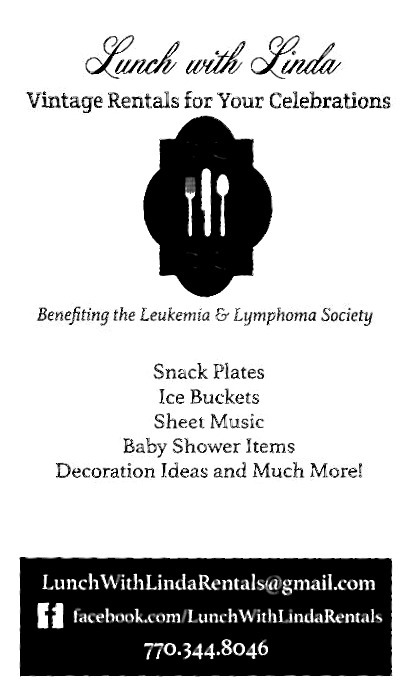 If an organization has ever hosted a fancier tea than the one I had the privilege of attending Saturday afternoon, I’d like to hear about it! 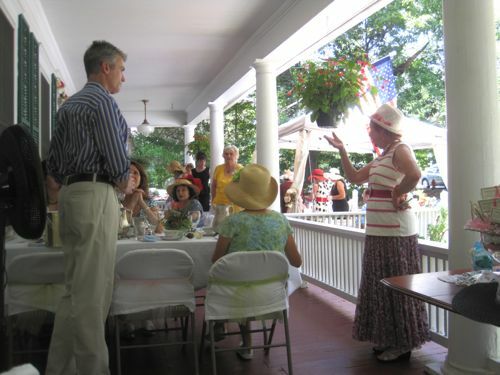 Members of the Senoia Area Historical Society absolutely outdid themselves with their “Summer Tea on the Porch” event, and oh, I wish you all could have been there. Actually, one of you was! 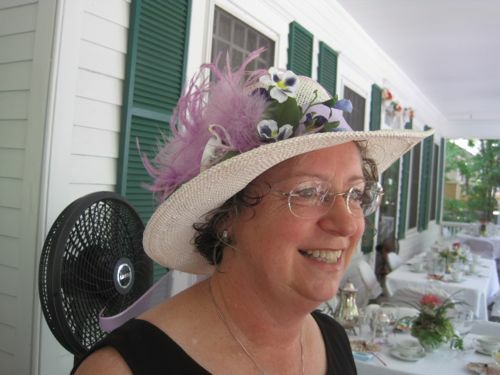 As soon as I pulled up, I noticed the lady parked in the car in front of me was wearing a pretty hat, and when she got out I saw that it was my friend Cynda Pierce, whom I got to know through this tea blog. We now run into each other all over the place — church, the Chamber, a summer Bible Study — so I just smiled when I saw Cynda was going to be at the tea. (Yay!) 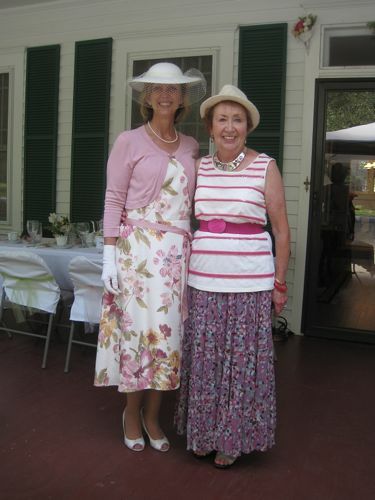 Here is Cynda, at left, with my friend Nancy Roy, who is a longtime member of Senoia’s historical society. Nancy is very dear to me because she took me under her wing when I was a young reporter fresh out of college and covering Senoia's historical society. We've been friends ever since! 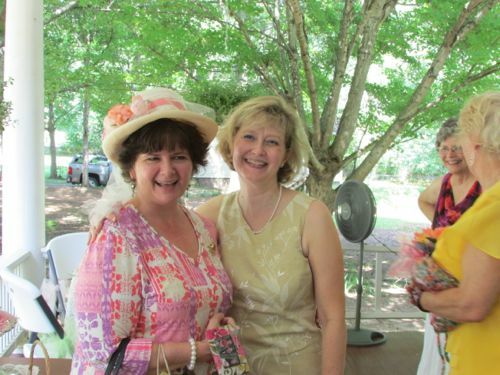 When guests started arriving, I was so happy to see the nice ladies from Peachtree City that I met when I spoke to the historical society earlier this month. 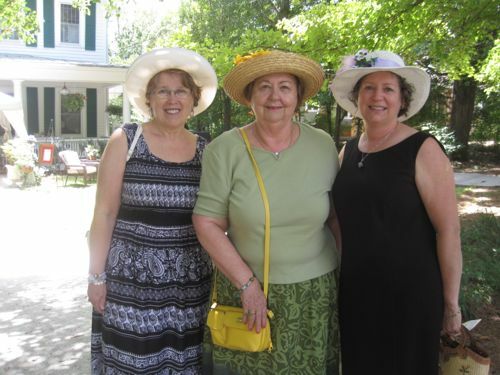 Here are Gloria Downing, who is originally from England, center, with her friend Carol Allessio, at left, and daughter Cheryl Bains, at right. It was fun to run into them again! Nothing says summer quite like a row of wicker chairs all lined up, yet another touch that made everything look so welcoming and inviting. I must admit I was rather surprised to realize this would not be a buffet tea as I had assumed but an individually plated tea. For 40 people? On a porch? How on earth would they pull this off? 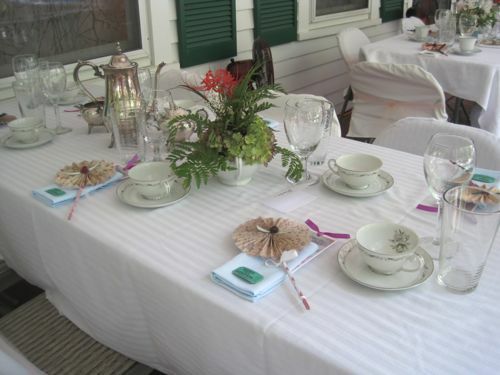 The tables were elegantly decorated with fabric cloths and napkins, silver and china, glassware, fresh flower arrangements and delightful favors. Maybe they were just faking it really well, but everything looked perfectly serene and calm when I got there 30 minutes early to get my instructions for judging the hat contest. 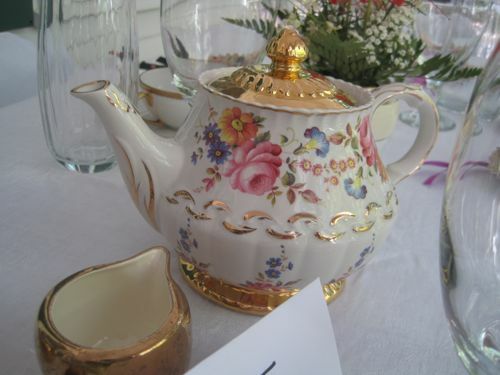 I had plenty of time to wander around and snap some shots of the pretty teawares on the tables, like this teapot! The table favors were quite impressive. Someone(s?) 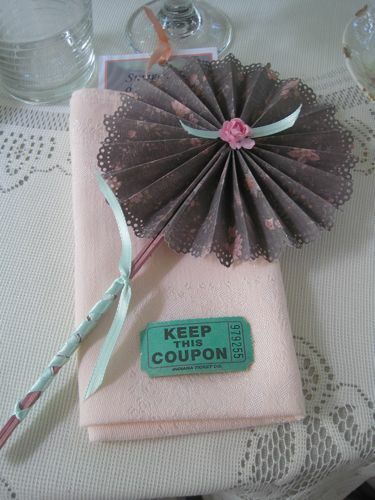 went to the trouble to make these handcrafted paper fans, which were a) gorgeous and b) useful! 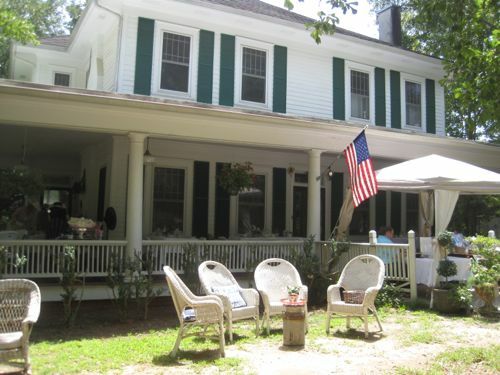 There were electric fans all over the porch (which actually made it comfortable for August in Georgia, no small miracle! ), but if anyone needed the individual fan, it was available. I never actually needed mine, but it was so pretty I definitely enjoyed having it to take home! 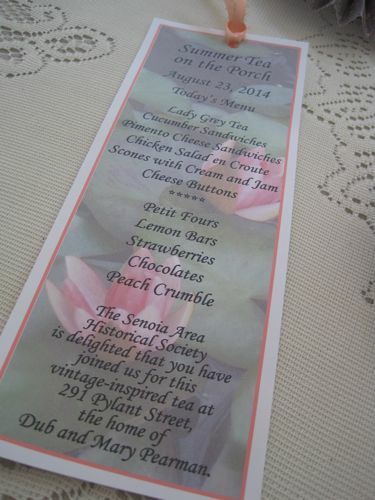 And this was another great idea: they printed the menu on handmade bookmarks! So I didn’t have to ask, “Now what kind of tea sandwich is this?” as I normally do, and I also have a fun memento of the day. The tastiest, prettiest Petit Four I’ve ever had! 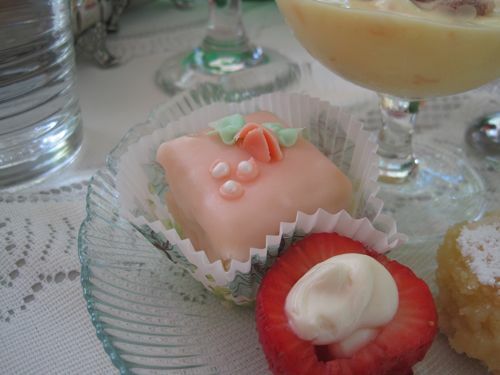 The cake was delicious, the filling was creamy, and as you can see, it was beautifully decorated. And a historical society member made these! Can you believe that? If it sounds like I’m gushing, well, I am. And because I’ve carried on so today, I guess I need to wait until tomorrow to share more photos and tell you who won the hat contest. You are going to *love* the unique twist to the winner’s hat … and I'll bet some of you will want to copy the winner's idea for yourself! 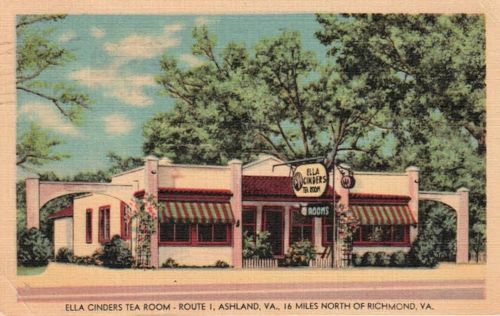 For this week's featured tea room postcard, I found another of those vintage linen postcards I so enjoy, this one from Ella Cinders Tea Room in Ashland, Va. near Richmond. 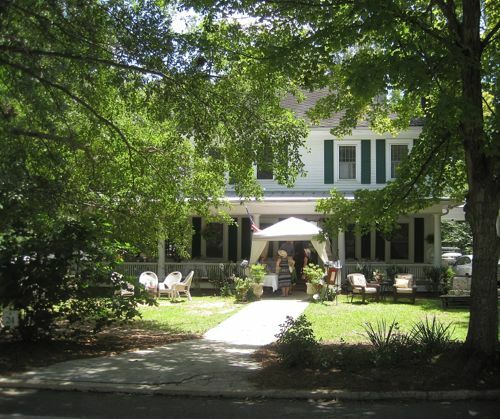 I just love the look of this place, from the pretty trellis and flowers at left to the white picket fence and the red and white striped awnings out front. Kind of has an ice cream parlor look to it, doesn't it? This card was sent to Mrs. O.S. 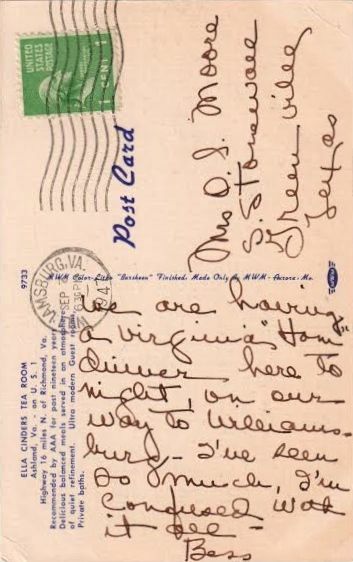 Moore of Greenville, Texas in September 1947 and reads, "We are having a Virginia 'Ham' dinner here to night, on our way to Williamsburg - I've seen so much, I'm confused with it all. Bess." Perhaps because I write and edit for a living, I always seem to be critiquing someone's writing, and with this postcard, I wondered why Bess put "ham" in quotes. Also, how did seeing so much on her trip confuse her? Sometimes I'm overwhelmed or tired by all I've seen on a trip, but I'm rarely confused by it. 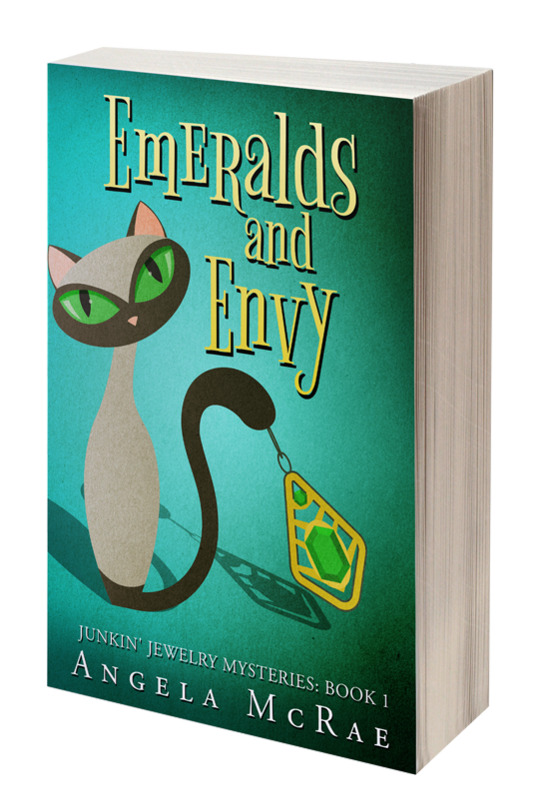 (If my husband reads this, he will tell me, as he so often does, "You need to take off your editor's hat.") Also on the back of this card, it reads, "Recommended by AAA for past nineteen years. 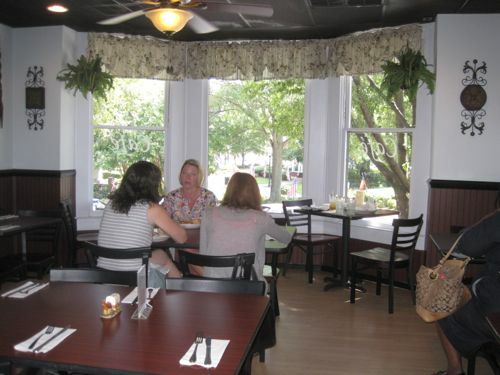 Delicious balanced meals served in an atmosphere of quiet refinement. Ultra modern Guest rooms, Private baths." Definitely sounds like an interesting tea room and one I would have enjoyed visiting! Ms. Norton! I believe I have your snail mail address from a previous giveaway win, but if you'll confirm by e-mailing me through the button at right, I'll get these goodies headed your way. Congrats! 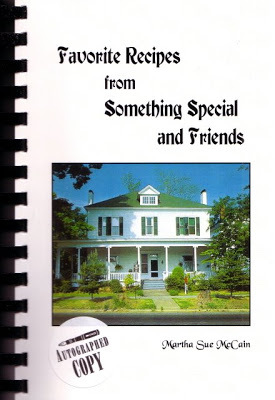 It's actually quite fitting that Something Special host teas once more, as many years ago the home was indeed the site of a tea room, and the previous owner's cookbook is one of my prized tea room cookbooks! I'm going to keep Mike's Tea Plate Menu handy so I can share it with the next person who asks me where they can hold a tea locally, and if you'd like more info visit sspecial.net. I am so pleased to hear Something Special is now offering these teas (by reservation), and I definitely want to help spread the word! 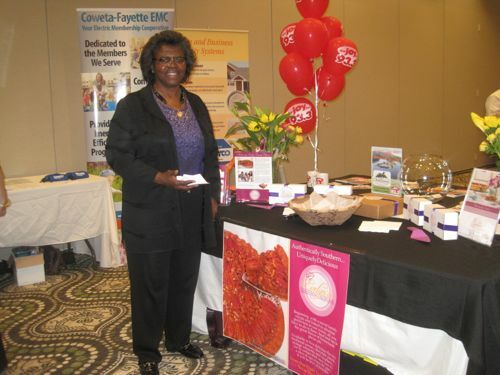 The other fun contact I made at the small business showcase was Evelyn Lewis, the entrepreneur behind Evelyn's Ultimate Pecan Pies and More. I love to support small businesses, and I'm surprised I hadn't yet heard of Evelyn because apparently her famous pecan pies are being shipped all across the country! And heaven help us, she had samples of them at her exhibit. I was more than happy to take the sample I was offered, and it was divine! 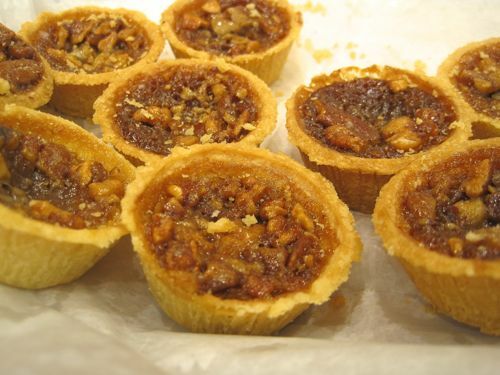 I do love a good pecan pie, and the bite-sized ones are always a treat I love to see on a tea tray. There's a special ingredient in her pie, though, I could tell. I mentioned it and she just smiled knowingly. I may have to order a full-size pie and see if I can figure out what her secret ingredient is. So, those are two of my local businesses I thought it might be fun to tell you about. 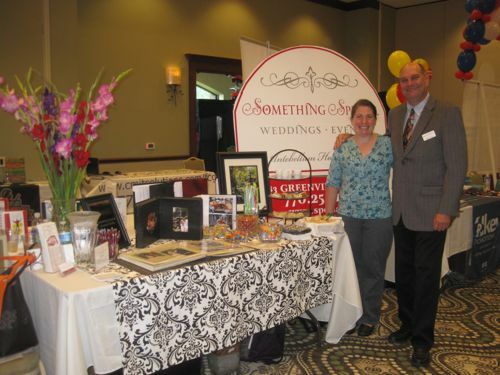 Do you like to support the hometown businesses where you live? 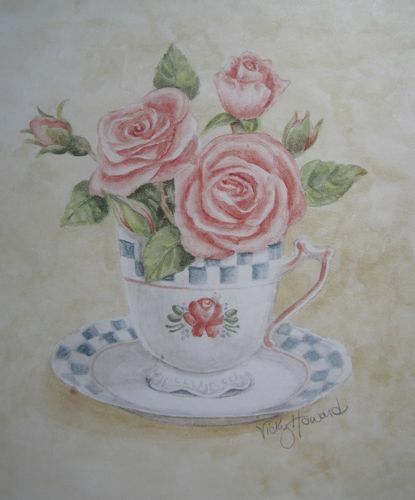 Recently my Aunt Jane and I visited the Salvation Army thrift store in Rome, Ga., where I was happy to discover a new bit of tea art, a picture by an artist named Vicky Howard. 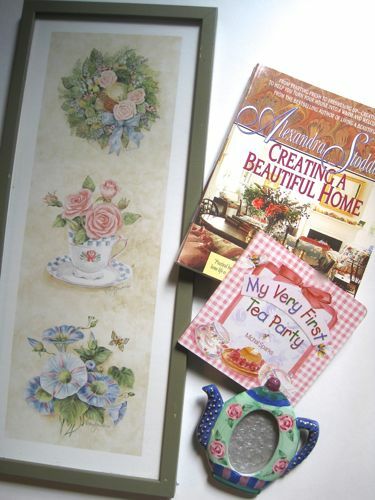 The $1.99 picture will hang in my office until the "tea house" gets built one day, and then it can go out there! Now I'll buy books at any place that sells them, but books for 39 cents each? Oh, yeah! 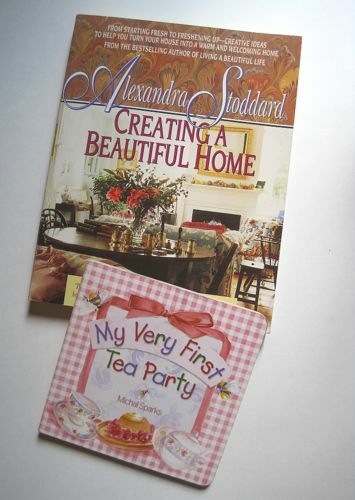 I didn't have this one by Alexandra Stoddard or the little board book, "My Very First Tea Party," which is bound to come in handy sometime. And finally, a teapot frame for 59 cents struck me as an unusually good bargain. Have you come across any good tea-themed bargains lately, either old or new? 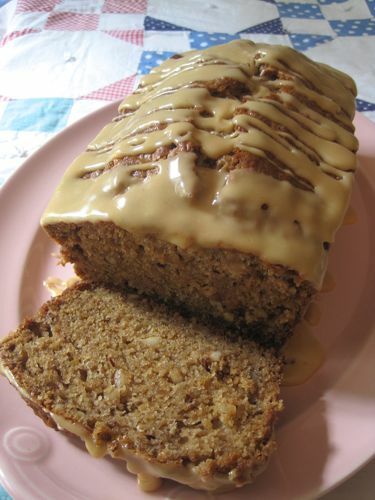 I needed to use up some apples, so I decided to tweak a Pumpkin Tea Bread recipe I've had for a while. For a glaze, I decided to add some caramel dip to the powdered sugar and milk and see how that worked. Mmm. That's all I'm sayin'. 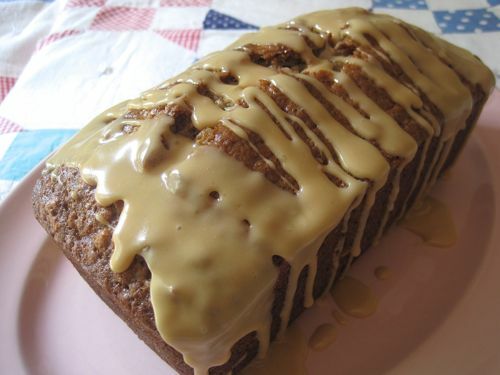 Of course you can eat this moist, apple-rich loaf plain if you like, but when there's caramel around, why would you? Preheat oven to 350 degrees. Spray a 9 x 5 x 3-inch loaf pan with cooking spray and set aside. In large bowl, add flour, sugar, baking powder, baking soda, salt, spices and nuts and stir. In smaller bowl, combine apple, eggs, oil, milk and vanilla. Make a well in center of flour mixture, add apple mixture and stir just until combined. 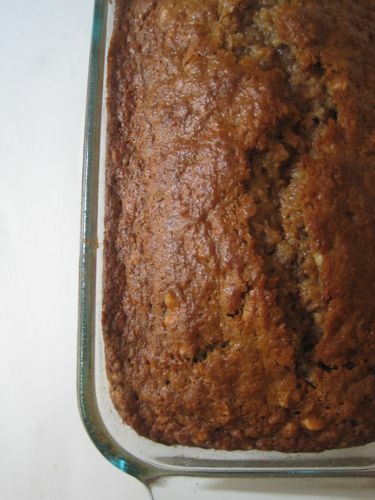 Pour batter into prepared loaf pan and bake for about 1 hour or until a knife inserted in the center comes out clean. Place pan on a wire rack to cool for 10 minutes and then remove loaf from pan to finish cooling. If desired, top with glaze. 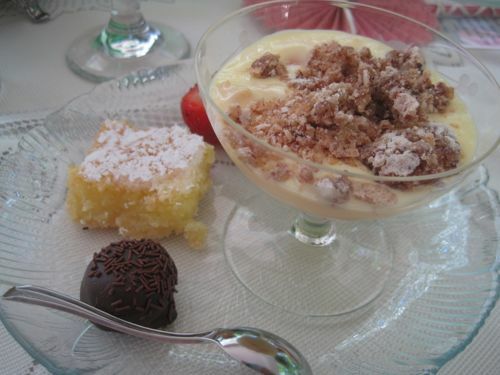 Glaze: In small bowl, add confectioners' sugar, caramel dip and enough milk to combine well using a small wire whisk. Drizzle over bread as desired.